Product #60598 | SKU LA-MFT-M42 | 0.0 (no ratings yet) Thanks for your rating! 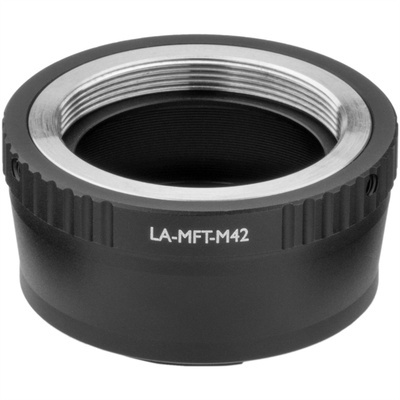 Make the most of your existing collection of M42-mount glass with this Vello Lens Adapter that will allow you to mount these lenses to a Micro Four Thirds camera. Precise construction makes it easy to attach these adapted lenses to your camera and keeps it secure during use. Infinity focus is guaranteed, ensuring that you get proper functionality our of all your optics. Additionally, the adapter is made from a durable zinc alloy and features a matte black finish on the inside to reduce the potential for glare and reflections that can negatively impact image quality. Although the lens will fit physically, autofocus, automatic diaphragm (AE metering), and other functions dependant on communication between camera body and lens will be disrupted by the lens adapter. You will need to focus manually, and to set exposures manually or metre in aperture priority (stop-down) mode. If the lens does not have a manual aperture collar, the aperture will be stopped down to its smallest f/stop. Focusing to infinity is retained. This adapter enables the use of M42 lenses on Micro Four Thirds cameras, meaning you can now use your existing stable of lenses on your current camera. It is also very secure, holding the lens in place without any wobble sometimes associated with the adapting process.